You can have control over your cold email deliverability. In outbound outreach, it’s crucial how many of the emails you sent actually get to your prospects’ inboxes. There are at least 14 points on a deliverability checklist that you can, and should, go through before you start off your email campaign. I’ve listed them below in three categories. Some of them you may already know of, but some may be new for you. Check the list and see if you’re doing everything you can to ensure that your cold emails actually get to their destination. The configuration of your email server and email account is an important factor that affects deliverability. It’s also a factor that many email senders ignore from the very beginning. You can’t afford to ignore that if you want your outbound outreach to go smoothly without any bottlenecks. Check what to pay attention to. You’re sending various emails from your main business email account (emails to your co-workers, friends, customers, partners, etc.). Your entire team is also sending emails using their addresses on the same domain ([email protected], [email protected], [email protected]). The truth is, you can’t entirely control either the number or the quality of all emails coming out from your company regular email addresses on your regular company domain. And if you aim at top-notch deliverability scores in outbound, this is one of the top things you need to be able to control – the reputation of your domain and IPs. That’s why, the most experienced outbound email senders set up a separate company domain, and email addresses on this domain, which can be used exclusively for outbound email campaigns. Having done so, you have a full control over the number and the content of the emails coming out from your outbound mailboxes, and you can easily adjust the sending settings in case you exceed quotas. Additionally, doing outbound you need to be prepared not only for successful campaigns but also for some failures. You’ll be experimenting and testing a lot. With that in mind, you’d rather want to avoid risking the reputation of your main company domain. You can set up a separate one that will allow you to dynamically test some campaign variations and feel secure at the same time. Once you have a fresh domain and newly set email accounts for outbound, you need to warm them up. What does that mean? The trick is to start sending a very small number of emails from them, at various times of the day, and ideally also reply to some of those emails. Just start using the outbound-dedicated accounts just as you’d normally do with a freshly set up email account. New accounts shouldn’t be used to send large numbers of emails, as this is what spammers keep trying to do: set up a new email account, send as much as you can before you get blocked, forget about the blocked account, set up a new one, and repeat the whole drill. You’re not a spammer, so don’t give your email provider a reason to think so. Start slow, like ~5, then ~10, then ~20, then ~30, then ~50 emails a day. Gradually add a few emails daily, until you get to the planned number of emails. But try never to go over 50-100 emails from one address a day, anyway. Remember that you’ll need some of your optimal sending capacity for the follow-ups. It’s not really about quantity, but rather about quality. More about that later in this post. This is one of the crucial things to check, and a process to be described in a separate post coming soon. In a nutshell, there are several free tools available on the web that allow you to assess the reputation of your domain and the IP of your SMTP server (the server that sends your emails). For instance, you can paste your domain or IP at Talos to check, if its reputation is good, neutral, or bad. It will also show you, if your SMTP IP or domain have been classified in the right web category, e.g. Business and Industry. You’ll get much more information from Talos if you paste your IP, so if only you’re able to get that number, have it checked. If you’re not sure how to get the IP of your SMTP server, consult your developer or admin, or contact our support team for help. Those are two records you need to add to your email server configuration to make sure you won’t look like a spammer to other email servers. Here’s a full post on what SPF and DKIM actually are (explained in simple words). Make sure you read it and try to set it up. If you’re not a tech-savvy person, contact your email provider and ask them for help with setting this up. If you’re a Woodpecker user, you can, of course, ask our support team to help you figure this out. Each email provider provides its own hourly and daily limits for the number of sent messages. If you exceed those limits, your account gets blocked, usually at least for a couple of hours. In some cases, your mailbox may be blocked for good. if you don’t find any clear information, contact the provider directly and ask them about their daily and hourly sending limits. The words, images, and links in your emails may alarm spam filters. They may also irritate your recipients. Both the filters and the recipients can mark your messages as spam. If many of them do that, you can end up on a blacklist. That’s why it’s crucial to send quality messages and avoid some tactics that may resemble spammers’ activities. None of the parts of your email should include words that usually appear in spammy email offers. Just be careful with salesy language and expressions. Don’t try to sell in any of your cold emails or follow-ups. Keep the emails in a personal tone. Do you email your friends using expressions like: “once in a lifetime occasion”, “special offer”, “one hundred percent free”? I honestly doubt it. One: Well-personalized emails are more prospect-oriented. They don’t sound selfish and annoying to the recipient. Everyone likes to read about themselves. Everyone is interested in what other people have to say about their work. Especially, if it’s something good. If you get your prospects genuinely interested in your email, they won’t be very likely to mark your message as spam. On the contrary, they will be more open to respond to you and continue the conversation. 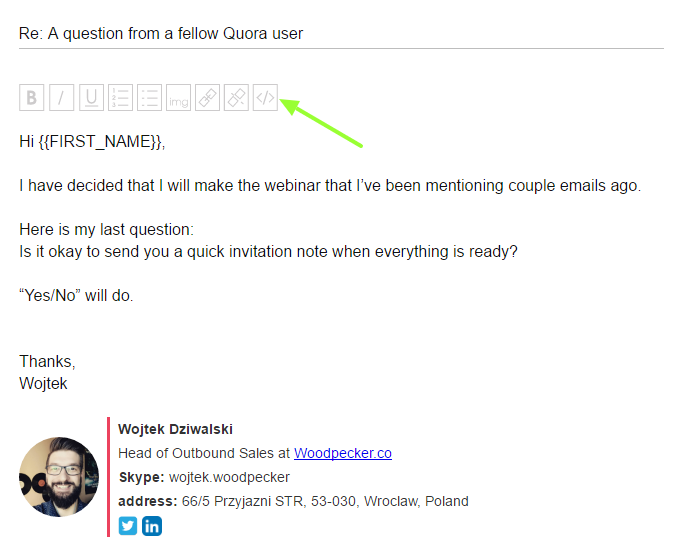 Two: Personalization makes every email look a bit different, even if they are all based on the same email template. If all your emails look exactly the same, and you send hundreds of them in a short time, you alarm the anti-spam mechanisms, and your account may get blocked by your email provider. Most email automation tools provide a system for merging some custom information from your contact base into your email template. In Woodpecker, we call them ‘custom fields’ or ‘snippets’. Except for standard fields like first name, website, company name, title, industry, you can insert even whole sentences or paragraphs previously prepared in your contact base, if you aim at highly personalized outreach. Here’s how it works: to check whether your prospect opened an email or not, a micro image gets attached to your message. If the recipient allows displaying images, the 1-pixel image gets opened when the email gets opened, and the tool that tracks opens gets the information that this has happened. Tracking links actually changes your native link into another one, usually on another domain than the original link you put in your email. When your recipient clicks the link, they first get into the tracking address, and then they get immediately redirected to the original address you wanted them to go to. Links that redirect the recipient to another place look suspicious to anti-spam mechanisms. Because of the nature of the link tracking process described above, if you really need to track links in your cold emails, you need to do it right. Here’s more on how to safely track links in your emails. Additionally, keep in mind that too many links will distract your prospects’ attention from the CTA. If you want to see replies, you can’t get them distracted or confused. I mean, don’t try to make it look fancy by adding html templates, pictures, gifs, colorful fonts, and other fireworks. Plain text emails look more natural to spam filters, that measure the text-to-html ratio and pic-to-text ratio. If your email has less plain text than everything else, it looks suspicious and may get into spam. More about it in this post. You can use a plain-text signature. But based on our experience, most of B2B email senders want to use their professional company signature, including their photo, company logo, etc. You can do that, but make sure the html of the signature is neat and well-organized. If you’re using an html signature right now, open the </> html mode in the edition of your campaign in Woodpecker. See what an html signature looks like. If the footer’s html is messy and takes much more space than the text of your message, it may trigger the spam filters. It’s a good idea to consult your developer and ask them to take a look at your html footer if you’re using one. Polishing the html may positively affect your deliverability. You can also test out a plain-text signature. The quantity and quality of your contact list have a tremendous impact on deliverability. A junk prospect base may spoil even the best cold email campaign that you’ve worked very hard on. Here’s what to pay attention to when preparing the contact list for your outreach. Collect contacts for a specific campaign. Don’t buy 5K contacts thinking, “I’ll figure out what to send them later“. Prepare a campaign for a specific batch of prospects. You can plan campaigns for small batches (even 20-50 contacts), and test the efficiency of your email copy plus delivery settings this way. Why does it actually matter? If you upload contacts in smaller batches, you have better control over the quality of your contact base. That’s why we recommend not to buy ready-made lists of prospects including thousands of records. It is your task to take care of the quality of your prospect base. Make sure you’ve got the right names, company data, and verified email addresses. Most list building tools offer email verification. Some of them will even return your credits for email addresses that turned out to be invalid. Woodpecker will also double-check your prospects’ email addresses before sending. Don’t guess email addresses, and if you have a larger contact base, split it into some segments and verify the emails before uploading them into a cold email campaign. If you see that many of the emails you sent get bounced, it may be a sign that you should take a look at your contact base. In such a case, you can try another list building tool or another contact base provider. That’s why it’s usually not a good idea to buy a large contact base at once – because it disables dynamic quality testing and improvement. If most of your emails look like this: [email protected], [email protected], [email protected], etc. you can assume that your emails will get straight to your recipients business mailboxes – where they should actually get. If you’re sending your emails to [email protected] or [email protected], the chances that your message will be read and processed get drastically smaller. Your emails should be addressed to individuals at a company, and customized for those individuals. If you send hundreds of identical messages, you’re just dropping leaflets. The people who get the leaflets may get annoyed by them, and mark you as a spammer. Even a few manual spam reports can get your IP into blacklists. So, what’s your score? How many of the 14 points are you already taking care of? I know it may seem overwhelming at first sight. And some of these tasks may seem infeasible without admin’s help. But you cannot ignore them just because they sound too difficult, or time-consuming. Or, you can, but then you shouldn’t be surprised that half of your emails get bounced, or that you got a ban for sending messages from your email provider. There’s no easy way out here. You need to get to grips with the deliverability checks if you want your emails to get to their destination. And if there’s something I’ve been missing that you’ve been doing to boost your deliverability, please let me know in the comments. I’d love to learn from your experience. Its really amazing 🙂 I am bookmarking this site and gonna come back frequently. Thanks Suraj, it’s great you find it helpful. Cathy, this is a super useful article for everyone who uses cold email outreach. Nice work! Thanks Cathy. Someone sent me this link as I’m about to start my first cold email campaign.